There’s probably not much to say or write about Lydia Lunch that hasn’t been said or written before. A cult legend in her own lifetime – a rare thing indeed – she remains one of the most formidable performers around. Tonight – performing the only northern show of three UK dates with Weasel Walter with her ‘Brutal Measures’ spoken word show (why said show happened to be in York… Those present weren’t merely grateful, but overjoyed, but those present were depressingly few in number), she’s uncompromising from start to finish. Before Lydia and sidekick Weasel Walter who drums and generates all mind of noise to accompany her take stage, Leeds punk foursome Flies On You deliver a visceral, in-your-face set of primal punk songs. It’s a challenging and emotional show, a mere fortnight after guitarist and lad songwriter Andy Watkins’ sudden and unexpected death. Front man Doug Aikman clearly struggles at times, but still pulls of a storming performance. And while the basis of what Flies on You do is meat-and-potatoes old-school punk, there’s a distinctly post-punk vibe that borders on goth in their rattling basslines and screeding reverby guitar peels. Moreover, it’s delivered with passion and a certain degree of wit – and the refrain ‘Katie Hopkins in human form’ is a great line whichever way you look at it. 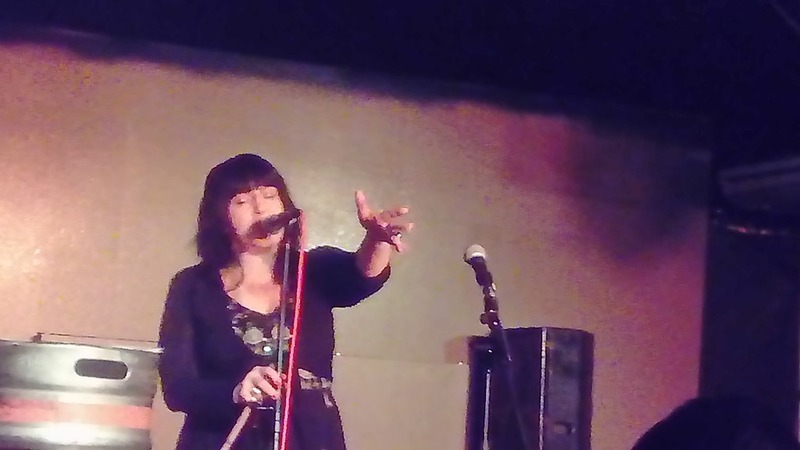 She may have mellowed with age, but Lydia Lunch is still infinitely more fierce in every way than pretty much anyone. It’s all relative. And she may not be large in stature, but her presence fills the room. Her voice is a cracked rasp for the most part, but she uses it to compelling effect. It’s not about being seasoned, either: this is her nature, who she is. Raw, real. Intense. Intense. Intense. ‘Brutal Measures’ is an extended spoken-word piece set in a number of movements, split by segments of hefty percussion and augmented by extraneous noise passages. Or, as Lunch’s bandcamp page describes it, ‘a longform composition featuring tense spoken word versus manic free drumming outbursts, glued together by cryptic electronics’. Recorded live, there’s an improvisational aspect to the musical accompaniment to Lunch’s words, which she delivers alternating between two mics, one clean, one heavily reverbed. The twenty-minute recorded take stretches to a full fifty-minute set live. And yet there is no filler: the drum solos breaks are tight, taut, concise and blistering. The instrumental electronic passages and the extraneous noise which both accompany and intersperse the chapters are intriguing, and the beer barrels Lydia uses as a table for her notes double as percussion instruments in the sometimes cacophonous batteries of sound between spoken word passages. She does get slightly pissed off when the stand for the clean mic slides down and is uncooperative, and the venue techs are slow to react – but then, who wouldn’t be? But she doesn’t make a deal of it, and continues her narrative stream regardless. She’s a performer, not a diva. As a spoken word performer myself, I am in awe. For me, it’s a challenge, and one I sometimes struggle with. Even the good nights are challenges. Lydia is in a league of her own. She holds the room, even with a whisper. She silences the chatting tossers at the bar. Not because she’s dictatorial: she does it for everyone who’s paid to hear her and Weasel and the chat at the back. Words fly every which way as Lydia sparks in all directions: she’s a relentless conjurer of images and ideas, with a perspective on everything. Even delivered slow, mean and low, it’s often hard to keep up with her endlessly swerving trajectory, but it all comes together to present a version of her world-view. And yes, it is pretty brutal, all told. It’s an early finish – but then, it’s a Monday night – but what the set lacks in duration, it more than compensates in intensity – did I mention intensity? 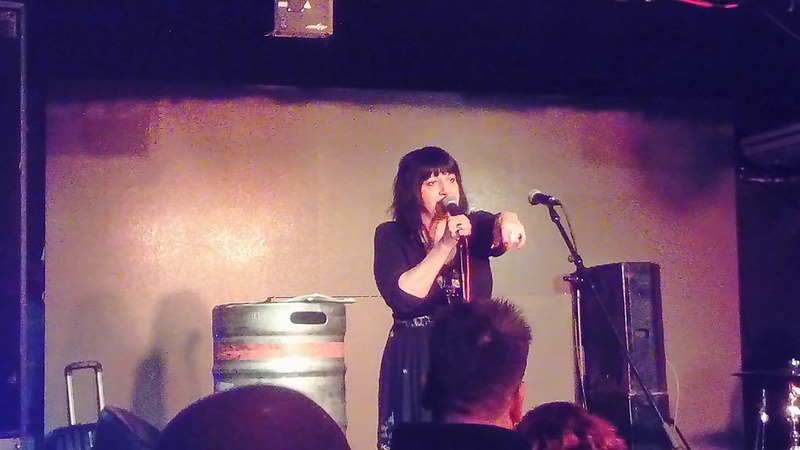 If some spoken word performances leave the audience departing wilting because they’re a trudge, tonight is very different: Lydia Lunch and Weasel Walter create something utterly compelling, that leave the audience wilting by virtue of its immense force. Spoken word at its best.